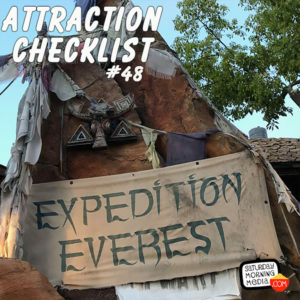 http://www.attractionchecklist.com – Join John and Grant as they brave Expedition Everest at Disney’s Animal Kingdom. Will they survive? Or will the Yeti capture them and force them to disco? Tune in and see! Recorded on March 22, 2018. This episode we venture to Disney’s Animal Kingdom in Walt Disney World to hunt the Yeti on Expedition Everest – Legend of the Forbidden Mountain. ‘Ride a speeding train through the Himalayan mountains while avoiding the clutches of the Yeti’ is how the attraction is described in the guidemap. Guests must be 44” tall to ride this attraction and the thrill level describes this attraction as a thrill ride that is dark with big drops. There is a single rider line for this attraction and FastPass+ is available. Before we head up the mountain, here are five fast facts about Expedition Everest – Legend of the Forbidden Mountain. 2. Expedition Everest’s track is 4,424 feet long and the trains can reach speeds of 50 miles per hours during the ride. 4. The mountain built for Expedition Everest is currently the tallest at Walt Disney World at 199.5 feet. They would have gone higher but any structure over 200 feet would need a blinking red light for low flying planes which imagineers felt would take guests out of the experience. 5. Finally, let’s talk about the Yeti. At the time it was built, the Yeti is the largest and most complex audio-animatronic ever built by Walt Disney Imagineering standing at 25 feet tall. A few months after the attraction opened, the animatronic’s framing split which could have signaled disaster if it continued to operate at it’s full capacity. Since then, the figure has only operated with extremely limited movement and the addition of a strobe light to simulate movement. Disney Imagineers have said they are always looking for a way to fix the issue but it’s difficult as the mountain was build around the figure. Let’s now ride Expedition Everest! Along for the ride today is John B. deHaas and after we ride we will give you our thoughts on this attraction. This is a binaural recording so if you have headphones put them on now as we head to Disney’s Animal Kingdom to ride Expedition Everest – Legend of the Forbidden Mountain.